Important: the following reflects my opinion and my opinion only. I report the facts at the best of my knowledge/understanding but they are not necessarily accurate. Of course I’m going to talk about /dev/tty keycaps set and the MT3 profile. The two are actually very different projects. MT3 is the new profile we designed. It was a long process but it went relatively smooth. We had many iterations of the keys, I got plenty of prototypes both 3D printed and injected. We were able to fine tune the shape up to the very last minute. Indeed the profile came out beautifully, better than my expectations actually. The result is a wonderful new and original profile. I was expecting the same process to happen for /dev/tty which is the first color scheme released on MT3. The color selection has been painful, with color samples coming on and off without logic. Sometimes completely wrong, sometimes missing some pieces. I asked to see the colors on an actual injected keycap because the result changes from the color chip (which is like a small tag of plastic) and the final product. That did not happen for all colors. I also asked to receive at least three options per color (one slightly lighter one darker). That also did not happen for all colors. I also discovered that color shades are not absolute but very much cultural. That added a layer of complexity dealing with China. Anywho. I did the best I could with what I had. At the end they turned out pretty well, except for maybe orange. I believe the problem is with the pigment that is not dense enough and the keycaps turned out not intense as I thought. That has been very difficult to explain because apparently nobody I interfaced with knew what I was talking about or what color pigment is. Dye sublimation is another story. I only got one partial sample in a very early stage. I was able to outline some problems and I was expecting to receive a final prototype before going full ballistic. That –again– didn’t happen. We were able to tune in with the manufacturer with some photos, but that’s it. Unfortunately in such complex projects organized between US, Italy and China some hiccups are bound to happen, but I can’t help but think that we should have done more. I’ve been told that Quality Control was set up but they need to be instructed first otherwise they don’t know if a rotated or a bolder legend are actually an issue. I’ve never been asked to train QC. Perfection is not a state of things, it is a process and it has costs. At one point you have to release and move the improvements to the next round. They reached the point where they couldn’t procrastinate anymore or the whole thing would have collapsed. What I am upset about is that I never received a final sample to review before the actual production started. I got a set –that I thought was still a prototype– the same time everyone else did. I was left with the assumption that the errors could have been still fixed but that wasn’t the case. Why didn’t I get a pre-production? Because making one sample and holding the manufacturing lane for a week is expensive and you may risk to lose your place in line and the Chinese new year was dangerously close. Still, the lack of communication from the first dye-sub sample up to last week is upsetting. I can honestly say that MT3 is heading where I wanted it and I can call it my creature. I can’t say the same for /dev/tty (that is spelled “device terminal”, btw) that is something I hinted and MassDrop and the manufacturer interpreted. Good news? The set is still pretty darn good and if you got a flawed kit just ask for a replacement, I know they are already working on it. So at the end it’s not that bad, still when you work on a project for years and you reach 99%, I can’t help but feel that bittersweet aftertaste for that missed 1%. Thank you for sticking with me up to this point. I can tell you that we are already working on a second release and this time we are making sure that everything is in place… At least so I am told. As someone who put down the cash, time and hope for a set of /dev/tty, this attitude is a little off-putting. You’re essentially disowning your creation because it wasn’t perfect while admitting that it couldn’t be perfect. That’s petty and betrays the rest of us who are involved in this. Instead, you should just accept it as flawed because it had to be flawed. In software development, perfection is something that’s always on the horizon. You can always see it, you can always get closer, but rarely is it actually attainable. You can spend 1 year on a project that works and is put together well enough, or you can spend the rest of your life rearchitecting and rewriting something that is put together ever more elegantly. In the end, the beauty of what you accomplish is only really worth it if it’s useful to someone. If you take too long, you’ll miss that opportunity. I think /dev/tty is miraculous. The profile is great, even if some of the legends are off. It’s great because right now there is nothing else that comes close to this set (as far as my personal MK preferences are concerned, anyway). I can only say that because it got rushed along by the realities of manufacturing, reached a critical point and had no choice but to ship. Thanks for your input, but I’m afraid you didn’t read between the lines. What’s written in between the lines varies by perspective. Thanks for your passion in what you do. If someone produces things that you have designed, but completely out of spec, don’t you then have the right to disown whatever it was that was produced? For future projects it could be useful to draw technical diagrams _with tolerances_ (and publish them to the people funding the group buy in question), so that one can definitely say when something has not been produced to the specifications and thus has to be rejected. It would also remove the need to train QC as they could just look at the specs and compare the product to them with calipers :D (or use computer vision, as it is easy to train if you have written specifications). I have noticed that (M)assdrop most of the time is just winging it until whatever is produced looks something along the lines of what one might imagine something could look like, instead of even trying to get it to match the renders that have been used to sell the product. I hope that in the future matt3o will try to get things done without massdrop in the loop, as they clearly have no idea of how to produce things of high quality. I assume the next iteration is in the works? I received the first batch of MT3, it’s not as perfect as the Granite set, but that has gone through 4 iterations. I read this entire post in your accent, by the way. I know that there is a lot of criticism with those with a place to voice their opinions and concerns, and that is only a fraction of those who purchased this glorious set, and from those, an even smaller fraction who received their set with blemishes are voicing theirs. But there are hundreds (maybe a couple thousand) more that could not voice their opinion; I will be the voice for them. I may not be credible because for one, this is my firs kit ever, and two I have only ever seen keycaps via images on the internet, but this set exceeded my expectations. As someone who received a set with the perfection you invisioned (that is: no misalignment, bold, or missing caps issues) I was giddy upon receiving them and there is no other word I could use to describe. I waited patiently an entire year almost, checked your blog and reviewed the discussion section on MD over and over with eagerness. I was disappointed in the images that were sent from China and had lost hope weeks before shipping. And then the complaints were pouring in. But I realzied any production will have faults whether it is a crate of fruit, a production of cars, or a production of lightbulbs. And upon arrival, those keys were the best set I had ever laid my eyes on, and that is only from judging caps that I had seen on the internet. Matt3o, I think you created something wonderful—a masterpiece. As a business owner I think it is only fair that you receive the best of your customer feedback, and I am one that would give your product a 10/10. Although I don’t just see this as a product, I view this as art. My only regret is that I have soiled these caps by installing them on a nameless, generic keyboard. I have placed a link to imgur so you can see how your wonderful creation can make even the ugliest of keyboards look magnificent. Thanks for taking the time to write and for the kind words. (it must have been exhausting to read the whole thing with my accent!). I don’t want to be any more explicit than the post above, but I think it’s clear that I love them and it’s because of that I’m upset with the parties that didn’t collaborate to make it even better. compensation). It feels like crappy R1 just funded the much better R2. You cannot be blamed obviously, though it would be nice to see some action outside of MassDrop – they are trully desperate for some real competition. Why don’t you make MT3 for Topre? You should grab some MX compatible sliders. All the MX sliders are garbage. When will the next drop arrive? I just want to commend you on creating what is easily the most ambitious keycap set to date. Not only did you pick a really nice colorway (or rather, two colorways if you factor in the two different modifier options) but you created a brand new profile of keycap. You took what people love about SA, the high-profile, retro, bold look and melded it with an ergonomic, sculpted design that makes it a pleasure to type on. So not only did you pursue an ambitious keycap project just by virtue of creating a new profile, but you went after what many believe is the holy grail of profiles; An ergonomic, high-profile keycap. Personally, I think you did a great job. I got the base kit (of course), Triumph Mods, and Triumph Numpad. I love all of them and they’re a pleasure to type on. Actually, the flat bottom row which I tried first after noticing no one else was giving it a shot was kind of painful to type on after a while. After switching to the normal R4 (I believe it’s 4) profile for the bottom, it’s amazing. I also love the Triumph blue. I was unsure about it at first and yeah it doesn’t match the renders perfectly, but I can honestly say I truly think it makes a much more exciting and eye-catching keyboard than the beige. The beige looks amazing, don’t get me wrong, but originally I was envious when beige orders shipped first. I started to second-guess buying the Triumph. But it wasn’t because the gray was any better, it was because they got theirs first and seeing it on real keyboards, a completed product, just looked way better than imagining what it would look like. Comparing my keyboard to others now, subjectively I love Triumph. Now, onto an important question: That all said, you mentioned perfecting colors and not getting prototypes when you should. Are you planning on tweaking the Triumph blue for Round 2? I really hope you don’t, even if it isn’t how you intended it to come out. So many people who own Triumph are planning to buy more child kits (myself included) and it would be painful to have Triumph r1 and Triumph r2 not match each other. I have a CM Master Keys Pro L RGB, which is a standard 104 key layout plus an additional 4 lighting profile keys. I grabbed the extra Triumph F1-F4 to cover those up right before that photo (and did a crap job, I can see I didn’t seat the F4 well). So I intend to get some novelties, but if they don’t match the rest of the Triumph on the keyboard it’s going to be a shame. Just my two (or four) cents. Thanks for an AMAZING set! Updated the way I handled the 4 profile keys. 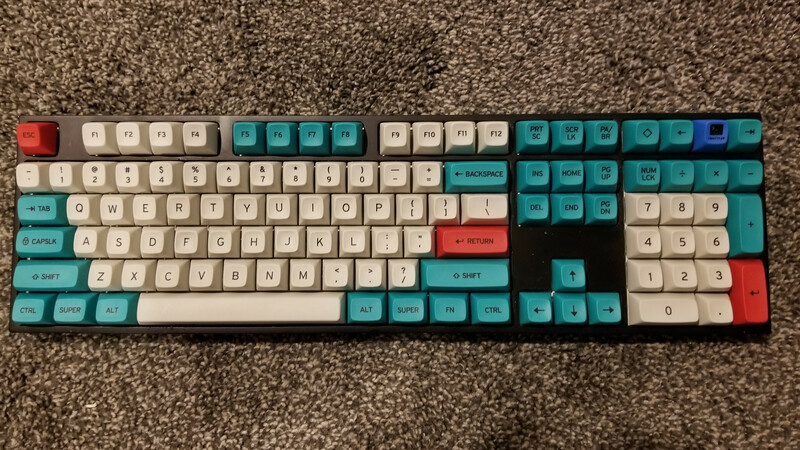 I replaced Scroll Lock in the normal 104 layout, and then used the /dev/tty keycap along with the diamond keycap and the two L/R arrow keycaps (not sure what they’re for TBH, other than that they came with the numpad set I believe) for the profile keys. That way I didn’t have to repeat F#s. It came out pretty solid, but I’d still prefer to get a novelty child kit that matches. I believe the only color that is going to change is orange. Is this true? Will the colour of the orange keys be changed? So say an orange RSE key from R1 won’t match the orange arrow keys (from Triumph Novelties) of R2? the R1 orange was wrong, I’ll try to fix it, but it’s not yet written in stone. I know R2 is close to shipping, but what was the final conclusion regarding the orange color? Very much looking forward to my second set of MT3 keycaps arriving, and I’m curious to see what the next colorway will be. Thanks again for great work! Question, how much misaligned must keycap be to be RMA worthy? I mean, most of my keyboard is more or less straight, but as complete set it looks a bit like loose tea printing (if you get what I mean). Profile is amazing for typing, feel with it too. Just that printing..
if you are not happy with it, you should totally let MassDrop know about it. Sorry to intrude, but I’d like to ask where I can find a link to the instructions you were working on to make your own keyboard? The \book link just goes as far as talking about the importance of keycaps. None of the fields are required! If provided, your email address will never be published.